I am all about color when it comes to crafting. There’s something about lots of different colors that just makes me smile. 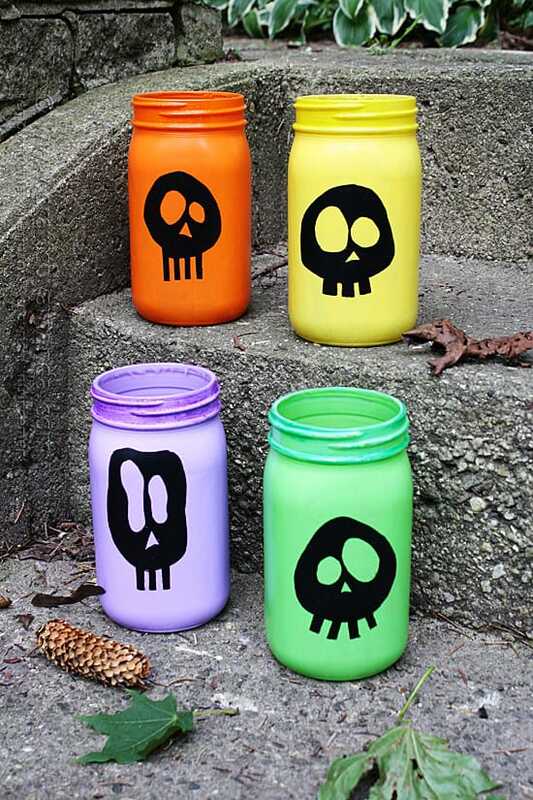 These skull luminaries use four common Halloween themed colors and will light up the night on Halloween! You’ll get a lot of comments and compliments on Halloween night as trick or treaters come to your door. They even look great during the day because of their bright and cheerful colors! Cool enough for teens but friendly and cute enough for little ones. 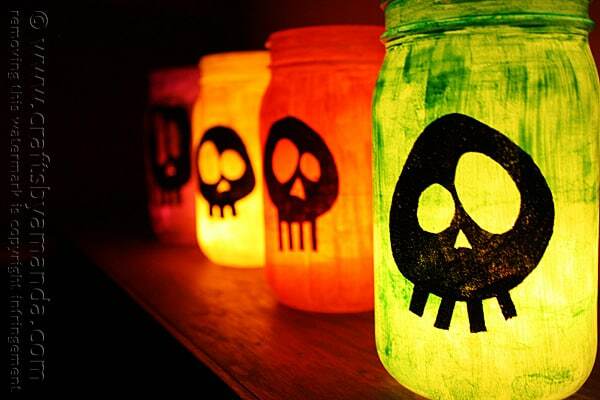 Of course if you’d like to try my ghoulish Halloween luminaries that would be fun too! 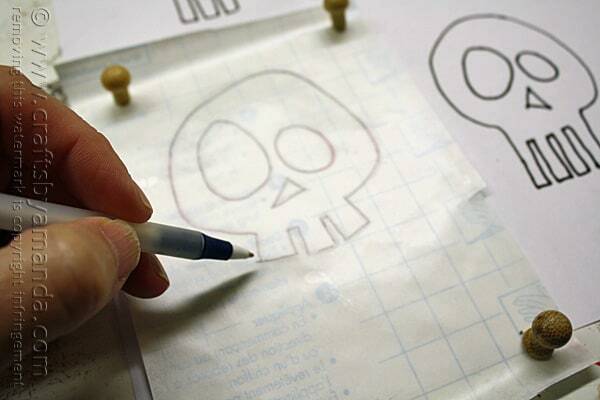 I’ll show you how to make your own stencils using some contact paper and my skull patterns. The pattern is downloadable from the printable instructions below. 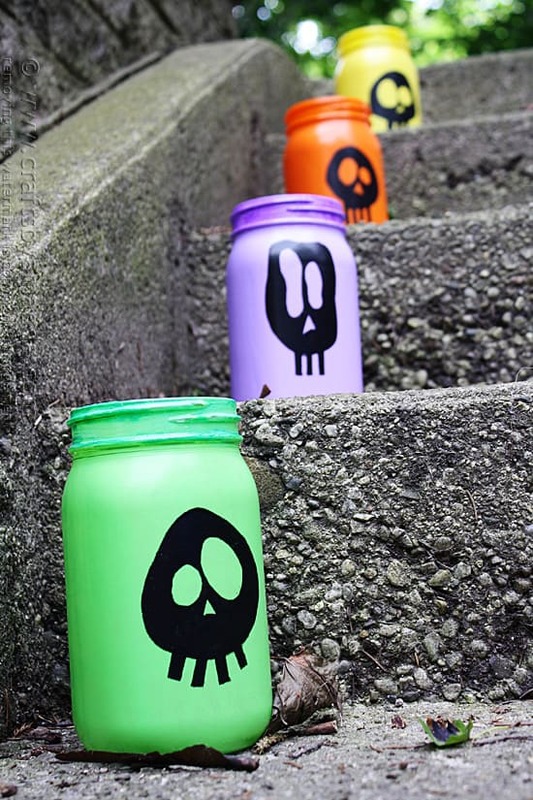 Here’s some step by steps to help you make these. These luminaries originally appeared in my monthly Chicago Tribune column. 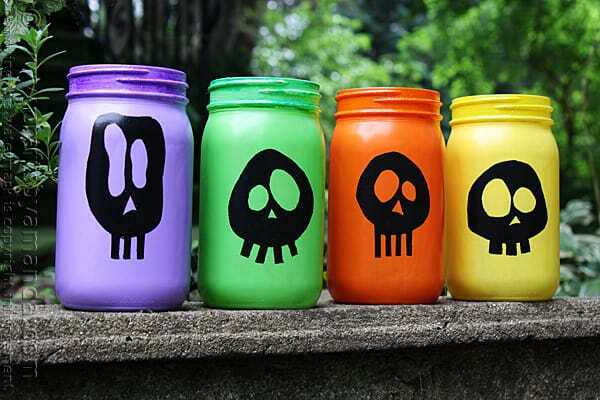 I used Americana Multi Surface Satin on these jars. 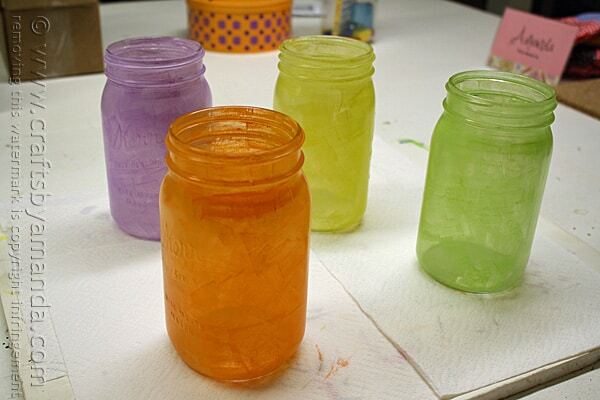 The colors I used were Pumpkin Patch, Iris, Apple Green, Lemon Zest and Black Tie. That paint is best applied with multiple thin coats. I did two coats with a cosmetic sponge, which really helps with light application. 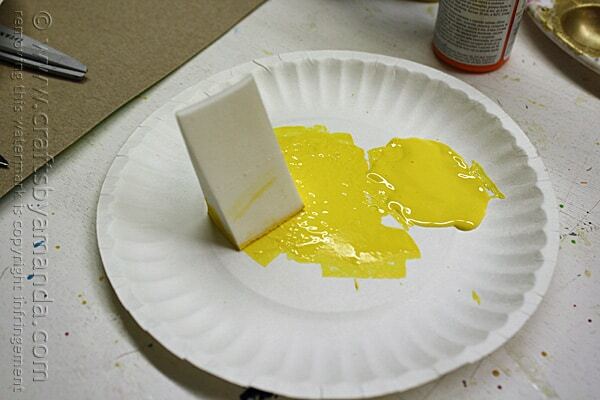 Dab the sponge into the paint and dab off the excess. Then apply to the jars. After those coats had dried, I did my third coat with a paint brush. 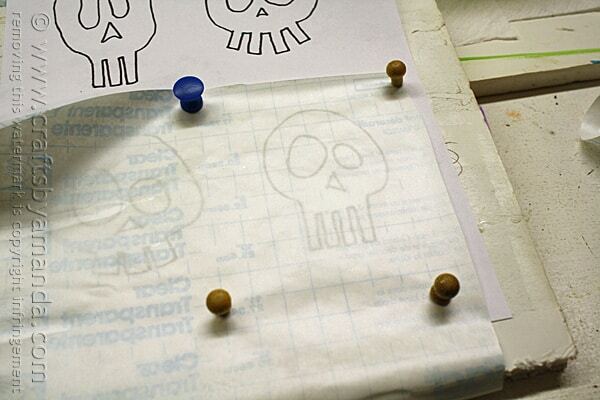 Print out the skull pattern and place it under the clear contact paper. Trace the pattern with a pen. I tacked mine down to a piece of foam core board to hold it in place. 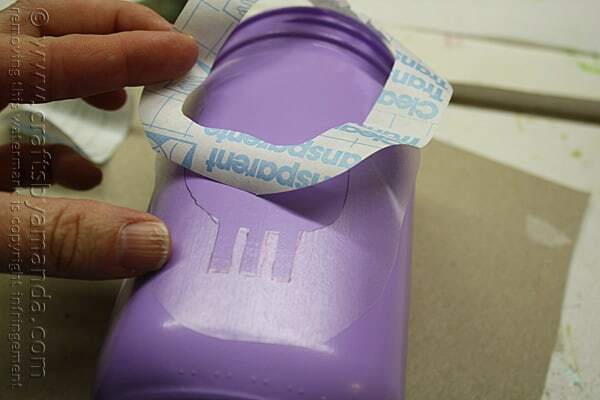 It makes it a lot easier than trying to hold it in place while you trace. Be careful when you cut these out. The natural tendency is to cut around the pattern. We need to cut INSIDE the pattern instead. Cut the skull out of the center. Cut the eyes and the nose out. I left excess contact paper on the nose since it’s so small. It would have been next to impossible to remove the backing otherwise. Next you’ll apply a thin coat of black paint using a cosmetic sponge. 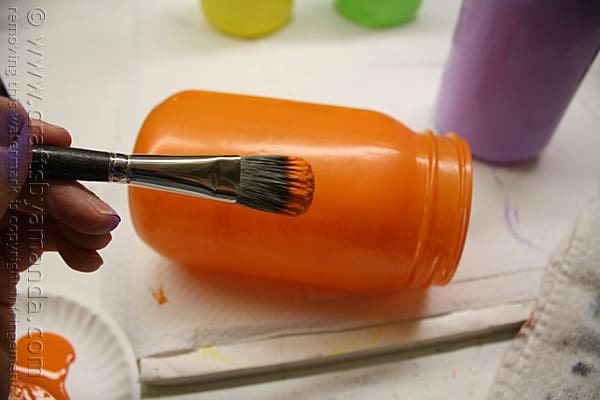 As with any stencil application, be sure to dab off most of the excess paint before applying. You will probably need two coats, apply right after the first coat. 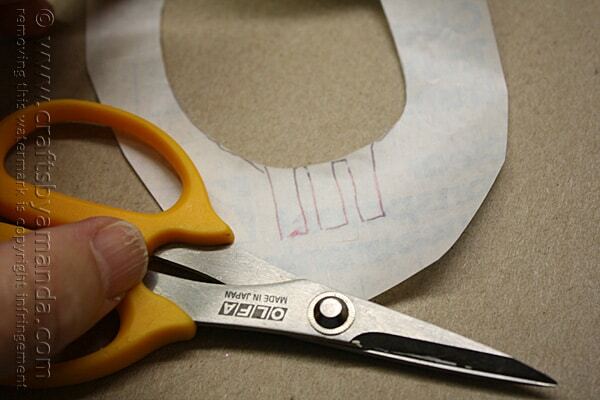 A tip for easier cutting. 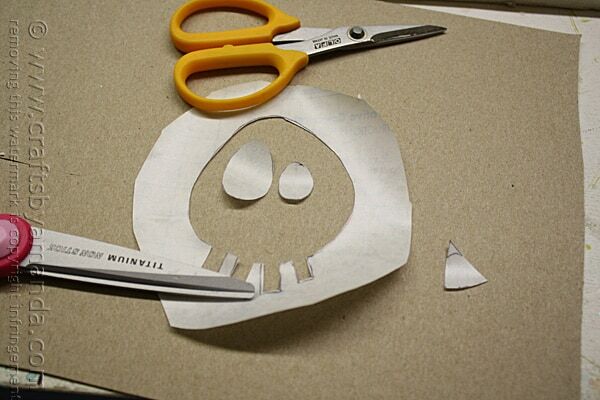 Since you don’t need to keep the inner skull portion of the stencil in tact, cut the circle of the skull out first then you can easily cut out the teeth without the contact paper from the skull getting in your way. 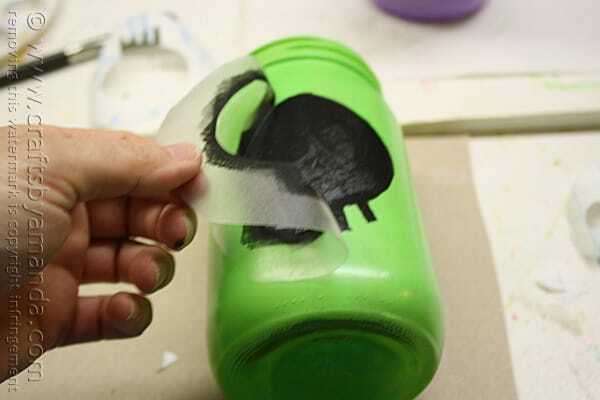 Another tip, this time for applying the stencil. 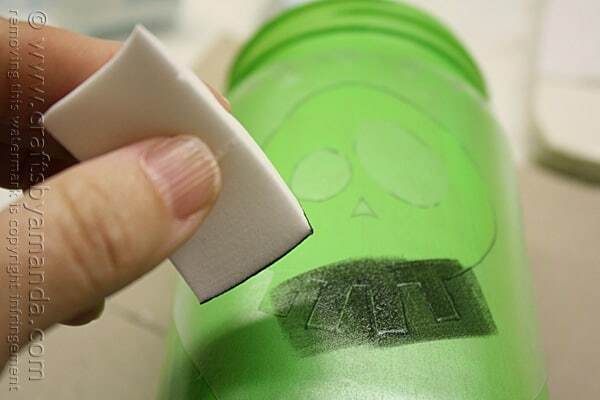 If you start by peeling off just the bottom section and apply that first, you can peel the rest as you go. 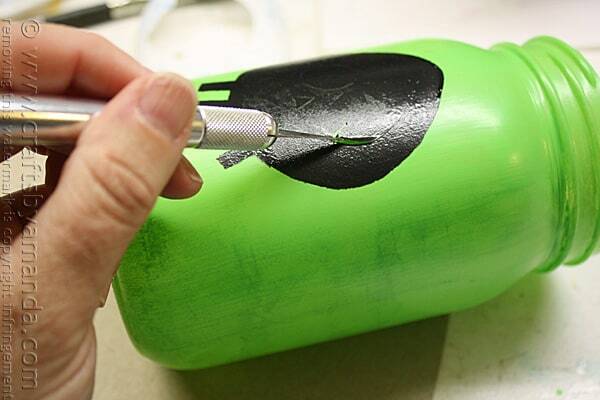 Once your black paint has been applied, don’t wait for it to dry. 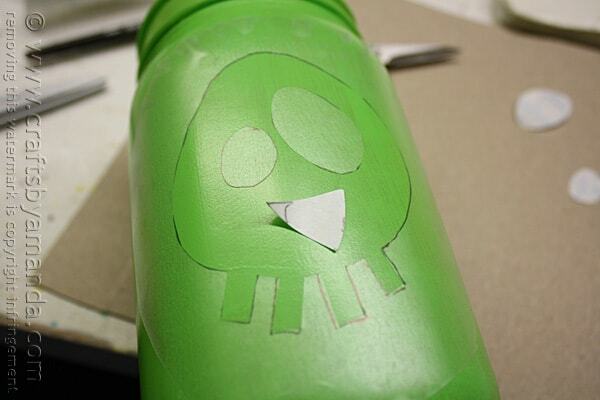 Go ahead and slowly peel off the stencil. The eyes and nose are admittedly a bit tricky to remove. 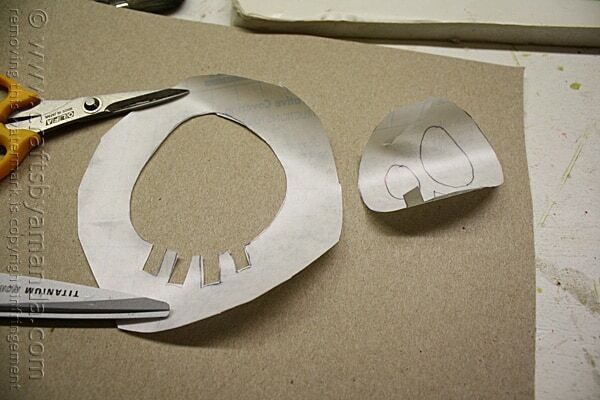 I used the point of a craft knife to carefully lift the edge of the eye stencil. I did make a couple scratches in the paint underneath, but nothing too dramatic. That’s it! 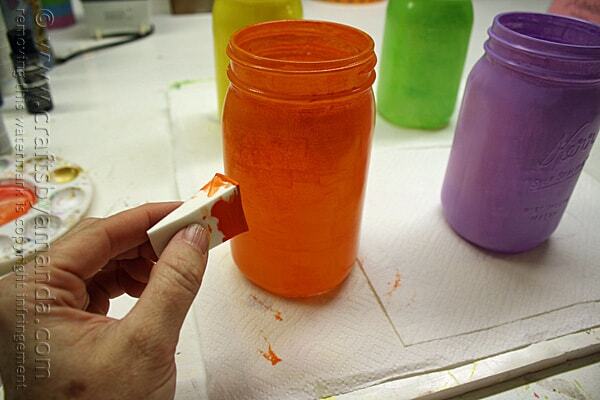 Once they are dry you can display them as is or place a candle inside. I used glass votive holders with tea light candles in mine. 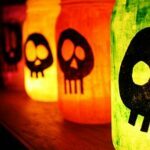 If real candles make you nervous, you can certainly try using those LED tea lights. Happy creating and Happy Halloween! Disclaimer: There are affiliate links to Amazon in this post. If you happen to click through AND buy something I will earn a small commission. These look so awesome! 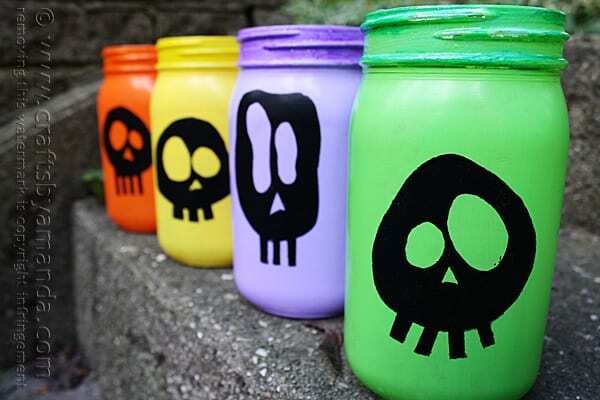 This is now on my must make list and they will look perfect for decorating the yard for Halloween. Thanks! I hope you get a chance to make them, they are so fun all lit up! your creations are simple but very effective .I mean very artistic. Thank you Katherine, they were fun to make! hahaha that orange one! I need it!